With Iranian President Ahmadinejad’s arrival into New York City, protests are taking place at the UN. In San Francisco, instead of protests, Shams Ensemble, a band coming from Iran, will be performing at Davies Symphony Hall on Sunday, September 27. This is their first overseas performance since the current uprising in Iran. Shams Ensemble, a musical troupe formed in Tehran has become a rallying point of overseas support for the Green Revolution in Iran. They will be performing in San Francisco to raise money for Amnesty International. Western regional director of Amnesty International on human rights worldwide, Banafsheh Akhlaghi and San Francisco Supervisor Ross Mirkarimi will be emceeing the event. The ensemble produced a song for Iran’s Green Revolution loosely translated from Farsi as “The Cry For Change,” and it became the anthem for action and involvement. The song became an underground sensation and over a million copies were distributed to Green Revolution supporters. The ensemble draws its inspiration from traditional Kurdish, Sufi and classical Iranian music and incorporates the poems of Rumi, a famed 13th Century poet and mystic. The nine-member group creates its mesmerizing music with the help of the tanbur, a traditional Kurdish lute, the daf, a framed drum, as well as Brazilian musical instruments. 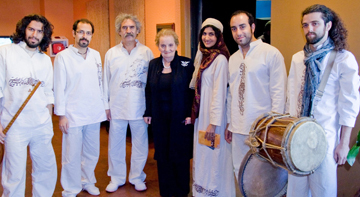 Since Shams inception, founded and directed by Kaykhosro Pournazeri, nearly three decades ago, the group has struggled to obtain permission to perform in Iran from the country’s fundamentalist Islamic authorities. But after entertaining troops in the Iran-Iraq War in the 1980s, the ensemble was able to secure permission to perform in public once. Now, due to the uprising during the elections, all permits have been canceled. Shams Ensemble does not know when and if they will ever be allowed to perform in their country again.